Want to become a welder in New York? You should know that there is plenty of welding certification schools in the state. 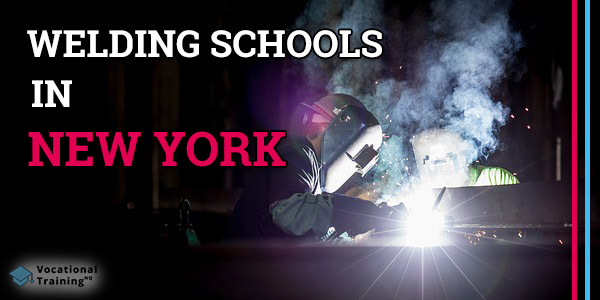 We’ve prepared for you the list of the best schools that provide welding training programs in the state of New York. Also, in this article, you can find some important basics that will be useful for future welders. 5.2 How to Become a Welder in New York? Working as a welder in New York, you’re going to earn a good median salary which is $46 300 (or $22.26 per hour). At the same time, a median salary throughout the country is about $39 390 annually. The top 10% of welders in New York have a salary that is higher than $72 000 per year. In comparison, the top 10% of welders throughout the USA earn an average salary of $62 100 per year. One another significant point is that welding in New York has an incredible outlook. According to the US Department of Labor, by 2026 the number of job offers for welders will grow by 22 500. There are 31 welding certification schools in the state of New York. They are located all over the state which means that you can choose the one that isn’t far from your location. Those who look for a welding training program in New York City should pay their attention to the School of Co Op Tech. You should know that it has facilities in all 5 boroughs of the megapolis. Consider the fact that this school co-operates with 100+ high school and Pathways to Graduation programs. Are you interested in working as an underwater welder? There is one school in New York that offers underwater welding program. It’s the Divers Academy International. Welding is a complicated process that requires excellent knowledge and a bunch of skills. Nevertheless, if we try to describe it, it sounds rather simple. Welders connect metal pieces together using various methods and tools. They can work on some small projects such as some art pieces as well as on big projects such as buildings and bridges. Working as a welder, you should be rather sharp mentally as well as physically. A welder needs to have extreme physical strength, stamina, dexterity, and self-motivation. Moreover, a welder should be good at interpreting blueprints and instructions. In fact, all of this requires absolutely precise skills. Welders should be able to choose an appropriate method and equipment according to project requirements. Sometimes they need to make measuring, cutting, execution, and, of course, equipment maintaining. In fact, there are more than 100 welding methods. Nevertheless, there are only 6 the most popular and you’ll learn these basic methods first. How to Become a Welder in New York? If you want to become a welder, you need to meet some requirements to start your training. First of all, you need a high-school diploma or GED. However, some schools offer such a program as “Pathways to Graduation”. One another significant point is that you need proper training and plenty of practical experience to get a good job as a welder. Welding has a lot in common with soldering and brazing. The main difference that welders don’t use any additional substances such as glue as metal pieces are melted so they can be joined. Speaking of soldering and brazing, they are also about connecting raw materials but there lower temperatures are used. For soldering, some metal fillers are required. Those fillers are heated and used as a kind of “glue”. In the case of brazing, there normally used some liquid flux material which provides better connection of metal pieces than soldering. As you can see there is plenty of welding certification schools in New York. You only need to make a final choice and start your training. It’s your opportunity to gain a successful career.